In 1972, the Greek folklorist Elias Petropoulos was awarded a seven month jail sentence for publishing the world’s first dictionary of homosexual slang. He was charged with the circulation of ‘obscene’ publications and insulting the Greek Orthodox Church, government authorities and the royalty. Containing over 3,000 words of Kaliardá, or the secret language used by ‘passive’ Greek queers, Petropoulos’s book eventually became a bestseller and has been reprinted numerous times. 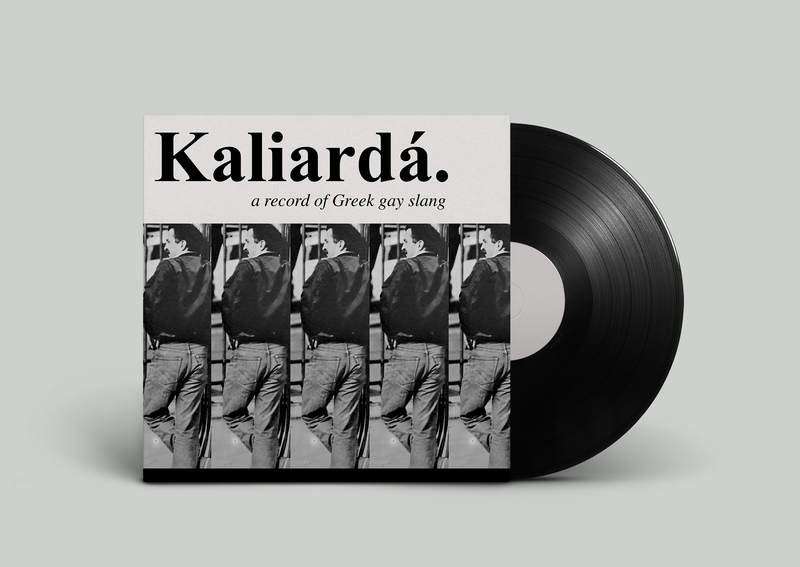 Despite Petropoulos’s intentions, no actual sound recordings of Kaliardá speech were ever made, let alone published on disc. The folklorist and lexicographer Mary Koukoules, who was wife to the late Elias, has no memory of any such recordings, on cassette or reel-to-reel tapes for instance, being left in his archive upon his death. The Elias Petropoulos Papers at the Gennadius Library in Athens certainly contain no sound recordings in their holdings. With no archival recordings to share, I will end this blog on Paola Revenioti’s 2015 documentary film “Kaliarda”. It focuses not only on the language itself but on the history of queer life in Greece during the 20th century. In a clip published on YouTube, Fotis sings an entire song in Kaliardá while accompanying himself on guitar. In his book, Petropoulos reproduces the lyrics to a song in Kaliardá that was also blocked by the censors, and thus never released. The full Greek text is presented below. με στέμα σαν και μένα. Kaliarnta (Kaliarda: An Etymological Dictionary of Greek Homosexual Slang), Athens: privately printed, 1971 / Athens: Pleias, 1974 / Athens: Nefeli, 1980, 1982 (Collected Works, 1993). “Kaliarda,” review by Kimon Friar, Books Abroad, October 1972. “Jagd auf Jakob” (About Petropoulos’s Kaliarda, Homosexuality, and Censorship), unsigned, Der Spiegel, 5 February 1973, p. 92. “Caliarda: la langue secrète des homosexuels grecs” (Kaliarda: the Secret Language of Greek Homosexuals), by Hélène Ioannidi, Topique: Revue Freudienne, No. 20, October 1977, pp. 115-150. “Kaliarda,” review by Jean-Luc Hennig, Libération, 16 December 1977. “The Greek Gays have a Word for It,” by Steve A. Demakopoulos, Maledicta, Vol. II, 1978, pp. 33-39. “Elias Petropoulos: A Presentation,” by John Taylor, Journal of the Hellenic Diaspora, Vol. 8, No. 4, Winter 1981, pp. 7-28. “A Greek Gay is a Greek Gay is a Greek Gay. . .,” by Steve Damakopoulos, Maledicta, Vol. VI, 1982, pp. 45-51. “Benávis ta kaliardá?”, by John Taylor, Gay Books Bulletin, No. 9, Spring-Summer 1983, pp. 14-19. “Kataggeliva” (Accusation: article mentions Kaliarda), Patrivß (Puvrgou-Hleivaß), unsigned, 1 July 1983. “Kaliarda Revisited,” by John Taylor, The Cabirion, No. 11, Fall-Winter 1984, pp. 10-11. Special thanks to Mary Koukoules. And an especial thanks to John Taylor, whose extensive bibliographic references on the Kaliarda were taken from his unpublished manuscript on E. Petropoulos.